NOTE: The CDC has identified El Salvador as an affected area of the Zika outbreak. Pregnant women are advised to be cautious as the virus can lead to birth defects. Adults affected by the virus experience fever, rash, joint pain, and conjunctivitis (red eyes) typically lasting a week. You can learn more by visiting the official CDC website. 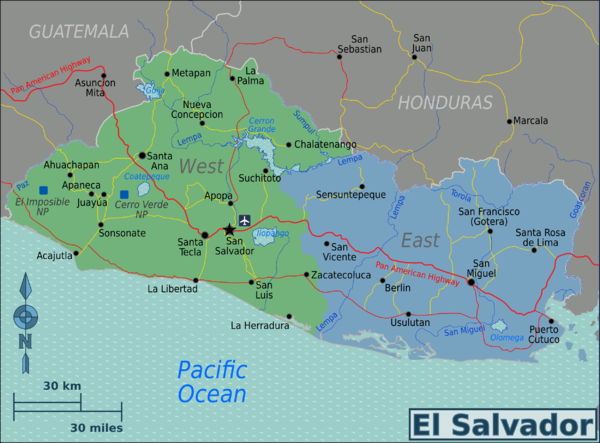 El Salvador covers an area of about 21,040 square kilometres (the smallest country in Central America), although it is the most densely populated. El Salvador is home to more than 6,500,000 people. It is divided into 14 sections called Departments. It has 25 volcanoes, 14 lakes, and three large cities and is divided in to East, Central and West with the the capital San Salvador in the central region, Santa Ana in the west and San Miguel the largest city in the east. 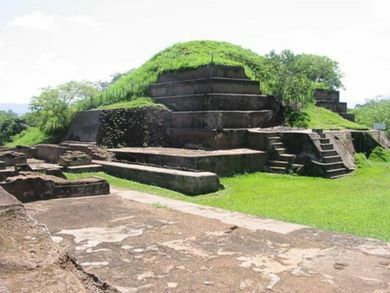 The civilization of El Salvador dates from the pre-Columbian time, around 1500 BC, according to evidence provided by the ancient structures of Tazumal in Chalchuapa. The Spanish Admiral Andrés Niño lead an expedition to Central America and disembarked on the Island Meanguera, located in the Gulf of Fonseca, on 31 May 1522. This was the first Salvadoran territory visited by the Spaniards. In June 1524, Spanish Captain Pedro de Alvarado began a predatory war against the native tribes of Cuzcatlán. During 17 days of bloody battles many natives and Spaniards died. Pedro de Alvarado was defeated and, with an injury to his left hip, abandoned the fight and fled to Guatemala, appointing his brother, Gonzalo de Alvarado, to continue with the conquest of Cuzcatlán. Later, his cousin Diego de Alvarado established the Villa of San Salvador in April 1525. King Carlos I of Spain granted San Salvador the title of City in the year 1546. During the following years, El Salvador developed under Spanish rule. Relations with Honduras deteriorated in the late 1960s. There was a border clash in 1967, and a four-day so-called Football war (Soccer War), as it was named by the international mass media, broke out in July 1969. The war ended with a cease-fire prompted by pressure from the United States and the Organization of American States. The Salvadoran forces that had invaded Honduras were withdrawn. They were just a few kilometres outside Honduras' capital. Citizens of the European Union/EFTA, Andorra, Antigua and Barbuda, Argentina, Australia, Bahamas, Bahrain, Barbados, Belize, Brazil, Brunei, Canada, Chile, Colombia, Costa Rica, Ecuador, Fiji, Guatemala, Honduras, India, Israel, Japan, Kuwait, Macedonia, Madagascar, Malaysia, Marshall Islands, Mexico, Monaco, New Zealand, Nicaragua, Panama, Paraguay, Qatar, Russia, Saint Kitts and Nevis, Saint Lucia, Saint Vincent and the Grenadines, San Marino, Sao Tome and Principe, Saudi Arabia, Singapore, Solomon Islands, South Africa, South Korea, Taiwan, Turkey, Trinidad and Tobago, Tuvalu, Ukraine, United Arab Emirates, United States/American Samoa, Uruguay, Vanuatu, and Vatican City can visit El Salvador for up to 90 days visa-free. Citizens of the mentioned countries except Belize, Costa Rica, Guatemala, Honduras, Nicaragua, and Panama must have proof of sufficient funds to cover your stay as well as documents stating your next destination. Holders of diplomatic, official or service passports of Belarus, Bolivia, Cuba, Dominica, Dominican Republic, Egypt, Grenada, Guyana, Haiti, Jamaica, Jordan, Kenya, Montenegro, Morocco, Pakistan, Papua New Guinea, Peru, Philippines, Serbia, Suriname, Thailand, Venezuela and Vietnam do not require a visa. Citizens of the European Union(except Bulgaria, Croatia, and Romania), Argentina, Chile, Colombia, Costa Rica, Guatemala, Honduras, Monaco, New Zealand, Nicaragua, Panama, Paraguay, Saint Kitts and Nevis, Saint Lucia, Saint Vincent and the Grenadines, San Marino, Sao Tome and Principe, South Africa, Switzerland, Turkey, Trinidad and Tobago, Uruguay and Vatican City do not need a tourist card upon arrival. All other citizens of countries/territories not mentioned need a tourist card upon arrival. Tourist cards are usually around $10. Immigration requires that visitors entering El Salvador have their passport and one of the following documents: visa or tourist card. Visas are issued by the Consulate of El Salvador accredited in the countries where these type of diplomatic missions exist; and the tourist card is generally issued for 90 days and includes Guatemala, Honduras and Nicaragua (you can travel for 90 days throughout those 4 countries, called the CA-4 and the visa does NOT start over when you cross borders of any of those 4 countries). When arriving by air, your visa can be purchased for US$10 at the airport. Land entrances are not charged for El Salvador as the visas for Guatemala, Nicaragua and Honduras include El Salvador in the CA-4 visa. Passports of certain countries might need to obtain a visa before entering El Salvador such as Malaysia. Some countries pay a fee for the issuance of the visa. Visas can be extended once per year for up to another 90 days. A list of detailed instructions in English can be found here. Visitors travelling by plane arrive at El Salvador International Airport in Comalapa, located on the beach forty-five minutes outside of the capital's city limits. The airport code is SAL. Avianca is the main airline as of May 2013 after TACA Airlines merged with Avianca. Although it serves in Bogota, Colombia, it now serves Costa Rica, Nicaragua, Honduras, and Guatemala after the TACA Merger and thus, it has now expanded services further to South America and Spain. Avianca flies a fleet of A319s, A320s, A321s (much of them from its former TACA Fleet) and other aircrafts throughout North, Central, and South America. A US$32 departure tax must be paid upon departure. Depending on the airline, the full amount or part of the tax may already be included in the price of your ticket and the amount you must pay will vary from US$0 - US$32. Avianca has a customer service desk at the airport and can provide information on whether or not the tax is includes in the price of your ticket. Other airlines that fly into El Salvador include American Airlines (from Miami and Dallas), United (from Houston, Newark, and Washington, D.C.), Delta (from Atlanta), Spirit (from Fort Lauderdale), Iberia (from Madrid), Copa (from Panama City, Aeromexico (from Mexico City) and Veca between selected Central American Cities. El Salvador now has a well developed GPS navigation system called QFind  that can help you move around either in urban or rural areas. This is a fully functional system with thousands of points of interest and turn by turn routing to your destination. A well-maintained and sparsely populated national park is found in the west at Bosque El Imposible. Additionally, there is Montecristo Cloud Forest, and a quaint fishing village with incredible local hospitality and remote coconut islands in La Isla de Méndez. 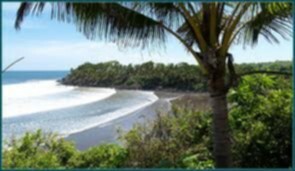 Isla de Olomega in the department of San Miguel is an excellent eco-tourism destination, as are the beautiful Isla El Cajete in Sonsonate, Isla San Sebastian, Conchagua, Conchaguita, Isla Conejo, Isla Teopan, and Isla Meanguera. One should also visit the colonial towns of Ataco, Apaneca, Juayua, Panchimalco, and Suchitoto as well as the Mayan sites of San Andrés, Joya de Cerén (The Pompeii of Central America and an UNESCO World Heritage Site), and Tazumal, whose main pyramid rises some 75 feet into the air. The on-site museum showcases artifacts from the Pipil culture (the builders of Tazumal), as well as paintings that illustrate life in pre-Hispanic El Salvador. Souvenir hunters will find some of the best artisans in San Juan el Espino and in La Palma (the artisan capital of El Salvador). Surfing El Salvador has a reputation for having some of the best surfing in the world. Tourists visiting other parts of Central America are increasingly drawn to the surfing meccas of La Libertad (near San Salvador), El Sunzal, El Zonte and El Cuco (near San Miguel ), transforming El Salvador into the fastest growing surf tourism hot-spot in Central America. 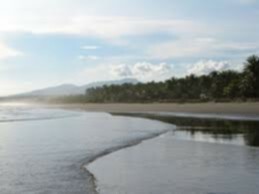 Playa Las Flores, San Miguel - One of the best surf spots in the region. Mayan Ruins While not as tall or as famous as the great Mayan Centers in Mexico, Guatemala and Honduras, the ruins are impressive in their own right. The biggest bonus will be that on some days, you may have the ruins entirely to yourself or with very few others. The two sites, Tazumal and San Andrés are around one hour from each other (driving) in Western El Salvador. The jewel in the crown however, is Joyas de Ceren (12km from San Andres), a preserved 1400 year old Mayan village that like Pompeii, was promptly abandoned during a volcanic eruption. While excavation continues to take place, you can walk around the beautifully preserved earth homes and view artifacts and petrified beans, maize, utensils and ceramics that were left locked in time, a small but intriguing snap shot of Mayan life. Volcano hiking at Parque Nacional Los Volcanes. 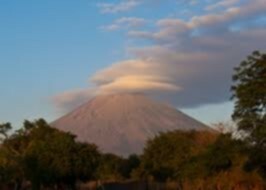 The Ilamatepec (Santa Ana Volcano) hike takes around 2 hours, guided hikes leave at 11am every morning from the Car Park at Cerro Verde. Hike through lush forest & the side of the volcano. The peak offers one of the most spectacular views in Central America - the strikingly turquoise lake in the crater, the nearby Lake Coatepeque (a volcanic caldera lake), the Izalco volcano nearby and on a clear day, the highlands on the Honduran & Guatemalan borders. Entrance fee to the park is USD $6 for foreigners or $3 for nationals (Salvadoran ID card or passport required). Lake Coatepeque a stunning volcanic caldera lake with natural hot springs fed from nearby volcanoes, surrounded by lush forests. A playground for El Salvador's upper classes for decades, much of it's shoreline is private property and the shore may be difficult to reach in parts. Accommodation options are very limited, however the lack of commercial development adds to the lakes' air of pristine serenity. Private holiday homes can be booked through online rental websites (such as Airbnb), along with a luxury boutique hotel Cardedeu, with rooms and suites starting from USD $400 a night. Boat tours of the lake can be arranged. Ruta de las Flores a route in western El Salvador famous for its coffee, that winds its way through picturesque villages nestled between lush mountains and coffee plantations. The lively villages of Juayua and Ataco are popular with Salvadorans on weekends, filled with markets, street entertainments and a weekly food fair. Nahuizalco has recently undergone improvements to its infrastructure and boasts a popular artisan market and local fresh food market with local produce, under the watchful eye of the Izalco volcano nearby. These colourful villages lend themselves splendidly to photography, and accomodation options to suit all budgets are available in the bigger towns. Tours of nearby waterfalls and coffee plantations can be arranged from Juayua and Ataco. La Palma is a tiny and remote, rainbow-coloured village. It is the birthplace of the country's modern art movement thanks to one of the country's most famous artists (Fernando Llort) and home to native artists and handicraft artisans. Along with the nearby town of San Ignacio, it is a focal point for tourists hiking the nearby challenging peaks around El Pital. El Boqueron National Park San Salvador's iconic volcano. A well maintained walk along the rim of the volcano that last erupted in 1917 is well worth a visit. A small entry fee includes entry to the information centre. The highlight is peering down the 500 metre deep crater, as well as the spectacular views of San Salvador itself. Food stalls cater to tourists. Parque Nacional Montecristo A cloud forest bordering Guatemala and Honduras, it offers some of the most enchanting and refreshing hikes in Central America. The forest is filled with rare animals including spider monkeys, toucans, pumas and exotic plants. Camping is the only option for accommodation, with a few different hikes available. Unless hiking as part of an organized tour group, you will need to bring your own food, water and gear. Temperatures are much cooler than the rest of the country, ranging from 10°C (50°F) to 15°C (59°F). Cerro El Pital A mountain popular with serious hikers, it is home to rare species of birds and animals. A great place to go camping and wildlife spotting. 12km from the town of La Palma, El Pital is the highest point in El Salvador at 2,730 Meters (8,957 Feet). The average temperature throughout the year is 10 °C (50 °F). Furesa Animal Refuge  a refuge for rare animals from around the world in beautiful surroundings. Activities include forest walks, waterfalls, camping facilities & zip lining. Animals include Toucans, Tapirs, a Bengal Tiger, grey foxes, and Pumas. Entrance from US$8. Jiquilisco Bay Explore this remarkable biosphere reserve, the largest mangrove estuary in El Salvador. Includes numerous bays, canals, sandy beaches, islands, forests and a freshwater lagoon complex. The bay is one of two Hawksbill Sea Turtle habitats in the Pacific. Puerto Barillas  lays at the heart of the reserve, popular with boat owners seeking solitude, and with accommodation and activities available. El Tunco An increasingly popular destination for backpackers, El Tunco was probably the only destination in the country that continued to be visited by few brave tourists during the civil war that ravaged the country, surfers in search of its famous breaks. While still popular with surfers, the lively bars, restaurants and hostels are a focal point for international backpackers visiting the country. El Cuco One of nicer swimming beaches in the country, small hostels and hotels abound. A slower pace than El Tunco, there is little activity in the town itself. The Equilibrio festival takes place in March each year, which includes a variety of workshops, yoga classes and dance floor revery. Held at La Tortuga Verde resort. El Salvador's official currency is the US Dollar (since 2001). Carry only $1, $5, $10 or $20 dollar bills. Most stores, supermarkets and department stores won't accept $50 or $100 bills. If you need to exchange to lower denominations, you can go to any bank. If you are from a country or territory with the US dollar as a official currency, you will not need to worry about understanding prices and currency transferring. Also if you are from Bermuda, Panama, or Bahamas, the official currency(ies) of the mentioned countries and territories have fixed exchange rates to the US Dollar. Meaning what price is said in El Salvador will be understood with your country's/territory's official currency. Example; $150 US Dollars will equal $150 Bermudian dollars, but you will still have to exchange currencies. The typical Salvadoran diet includes lots of rice and beans, seafood (particularly among those who live on the coast), and the most common Salvadoran dish, the famous Pupusa, a round corn tortilla filled with cheese and other elements, usually chicharon (shredded pork meat). It's widely agreed that the best pupusas in the country can be bought in Olocuilta, which you can get to along the highway on the way to the Comalapa airport. You will find 50+ pupusa stands there, competing for business. San Salvador's night life centers around 'Las Terrazas' at Multiplaza Mall in Santa Elena, filled with restaurants, bars and dance clubs that fill up each weekend with people of all ages. The close proximity of the establishments and the secure environment are a major drawcard for young revellers that enjoy partying till the early hours. Dress is smart casual attire. The Zona Rosa was once the buzzing and eclectic entertainment quarter of the city, until its epicentre gradually established itself at Multiplaza. The bars & restaurants at the base of the Plaza Futura Tower in Colonia Escalon are popular with business professionals on weeknights as well as expats, attracting an older crowd than Multiplaza. Smart Casual dress attire at most venues. New small bars and restaurants in beautiful surroundings are continuously opening up, some in older mansions around Escalon & San Benito & Circo Bar. These are popular with the well heeled of the city that prefer smaller venues away from the large crowds. These venues are the haunts of the 'beautiful & wealthy' set of the city, strict dress codes will usually apply & entry may be refused to anyone with no reason given. Paseo El Carmen in the historic centre of Santa Tecla has undergone a renaissance of sorts in recent years, with an increasing number of cafes, bars and restaurants opening up along the colourful street. Once the capital of El Salvador and only a short drive from Santa Elena, Santa Tecla is much safer than San Salvador, and is a beacon of hope and blueprint for the efforts to restore the much larger historic quarter of San Salvador to its former glory. Relaxed casual attire is sufficient at most venues. El Tunco Beach in La Libertad is only a 30-40 minute drive from San Salvador, with its lively bars and eateries being the focal point and main hangout of backpackers and surfers from around the world. Popular with young Salvadorans from the capital on weekends, El Tunco is a safe and fun destination for travellers, offering a different, more relaxed scene than the capital, with chilled out bohemian vibes. Bars open to the public can also be found at the luxury hotels. Smart casual attire is necessary. San Miguel has high end hotels on Av. Roosevelt by the Metrocentro mall and budget hotels near the bus terminal. In San Salvador, there are excellent budget accomodations in Colonia Escalon, Santa Tecla, Antiguo Cuscatlan, and San Luis. Finding employment in El Salvador is difficult for both Salvadorans and extranjeros (foreigners) alike, although bilingual schools are constantly looking for English speakers, as well as other foreign language teachers. Bilingual/international schools such as Escuela Americana and Academia Britanica Cuscatleca (British Academy) offer competitive salaries for qualified foreign teachers, and in some cases, accommodation included. Current vacancies are posted on the schools' websites. Urban Dog Sanctuary Located on the slopes of Volcan San Salvador overlooking the city of the same name, this sanctuary is run by Salvadoran-Scott Georgi McColl and has an excellent reputation for caring for the animals. She is always looking for volunteers to help maintain and care for the many dogs she has at any one time. She also runs free veterinarian clinics for locals and their pets and is looking for help there as well. Volunteers can stay for weeks or months. Contact her for more information. Eastern Pacific Hawksbill Initiative There are a lot of organizations claiming to care for the turtles and doing turtle releases around the country. This is one of the few doing it right, with a mind on the turtles and not on making money off of tourists. They are working hard to protect and grow the Hawksbill Turtle populations in El Salvador, which, with its 300 km of coastline, is where most of them come to nest. You can volunteer for as little as one week for a nominal fee. Permaculture Institute of El Salvador Just outside of Suchitoto, the Permaculture Institute focuses on teaching local farmers the theory of organic gardening. It often draws on knowledge of the local indigenous and uses the farmer-to-farmer method of teaching. They are always looking for new volunteers. There is a small fee to participate, usually around $400 a month to cover costs. Teaching You - El Salvador A volunteer program focus on Teaching English in Santa Tecla City, the program is runing from monday to thrusday, from January to November, you can apply for 2 weeks to 24 weeks, volunteers pay a fee that cover their accommodation, cooking classes, and other stuff. Centro de Intercambio y Solidaridad is often looking to hire bi-lingual project managers and liaisons, and offers both Spanish classes and numerous volunteer and cultural opportunities. El Salvador has a bad reputation due to the civil war of the 80s. The Consular sheet from the US State Department indicates that El Salvador has the highest homicide rates in the world. Crime is an issue, most of it is attributed to street gangs, though statistics from official sources do not support that claim. You must use common sense and avoid entering into a zone that does not appear safe, just like you do in any country of the world. Avoid carrying fancy items such as jewelry, expensive cameras, and watches if you are walking on the public streets. Females should avoid traveling alone as they may catch the occasional cat-calling and perhaps get sexually assaulted on tightly packed buses. As a foreigner the kind of response you might get from the police is "hit or miss." If you have been pick-pocketed or otherwise robbed without harm to your person, a visit to the police station will almost certainly be an exercise in frustration. Police officers have also been known to whistle or cat-call female travelers. It is a good idea for any person visiting El Salvador to keep only necessary forms of identification, such as a driver's license, when exploring the city or tourist locales. If you must keep your passport on you at all times, a traveler's pouch would allow you to have it safely with you. Police officers routinely ask tourists to present their passports, most can be convinced that a copy of the passport and the visa page is sufficient. Others will infrequently insist on accompanying you back to your hotel to retrieve your actual document. In 1996 San Salvador was considered the second most dangerous city in the Western Hemisphere, according to statistics. Since the end of the civil war in 1992 El Salvador has not seen a reduction in crime rates. Today San Salvador, and El Salvador in general, experience some of the highest homicide rates in the world, it is also considered an epicenter of the gang crisis, along with Guatemala and Honduras. The homicides reported in 2006 reached up to 3,906, in 2005 3,779 were reported; 57.2 violent deaths per every 100,000 people. Crime rates in general have been steadily growing throughout the years, from 2005-2006 crime rose 7.5%.El Salvador is the most dangerous and violent country in Central America. The government tried controlling the gangs with a tactic called "Super Mano Dura" which means "Super Strong Hand", however it has not been successful. In 2012, the Catholic Church has orchestrated a "gang truce" which has significantly reduced the number of homicides in the country - from 14 a day to 5 a day. The church (and now the government) have worked with gang leaders to procure for them work programs and other training and amenities in prison in exchange for a decrease in violence and turning in of weapons. This arrangement has sustained itself for more than a year. However, the "gang truce" failed in 2015, which spiked the murder rate by 52% with an annual number of 481 killed, with roughly 19 people being murdered each day as a result of a gang truce collapse. The violence in the country is rarely directed at tourists, and travellers have no more to worry about than any other developing country one may visit. However, that doesn't mean you're immune from becoming a target. There are great private hospitals staffed by doctors trained overseas. Many speak at least a little English. Salvadorans will tell you the best hospital to go to is Hospital Diagnostico which is one of the most expensive. It does have a good reputation for cancer treatments and research. 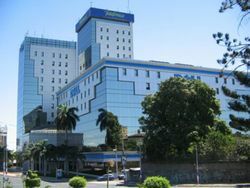 However, ex-pats living in El Salvador will often disagree and say that Hospital de la Mujer is much better, especially for minor surgeries, blood tests and anything to do with women's health. As there are more people having babies in El Salvador than cancer treatments, you may find that the nurses and doctors are in much better practice at the Hospital de la Mujer than at Diagnostico, where few Salvadorans can afford to go! Pharmacies are easily found all over the country, and antibiotics are plentiful without the need for a prescription. Pain killers (such as Vicodin) are impossible to come by legally as the US found that a high level of painkillers being brought into the country came from El Salvador. Even morphine is unavailable in hospitals due to this crackdown by the US. Be sure to have a first-aid kit if you travel to the countryside and to archaeological sites. There is very little chance of catching malaria in El Salvador - a much bigger threat is Dengue Fever, for which there is no protection other than mosquito repellant. Luckily doctors and hospitals are well-versed in treating and testing for Dengue. Ameobas and other parasites are commonly in tap and well water, so beware of where you buy your drinks and what your ice looks like. A good rule of thumb is that if the ice is molded (i.e. round cylinders with a hole in the middle, or perfect squares) it is usually purified water bought from a store and therefore safe to have in your drink. If it looks like it has been broken apart with an ice pick it's suspect. In Puerto La Libertad, many commodores (local restaurants often operating out of someone's house) get their ice from the fishing co-op on the beachfront street. When you see what else that ice comes in contact with, you will change your mind about drinks with chipped ice in them! Salvadorans are known for their great hospitality. Their country is one of the best mannered countries in the world. They are among the nicest people in the world. They are friendly, industrious people always willing to help anyone. That is what has earned El Salvador the nickname of "the country with a smile". When speaking with people you don't know, it is customary to address them in a formal manner, using señor, señora and/or usted. This page was last edited on 24 January 2019, at 04:28.